Yogurt Man (305/365) – Annoyingly Boring? Stop & Shop run on my way home from work tonight. 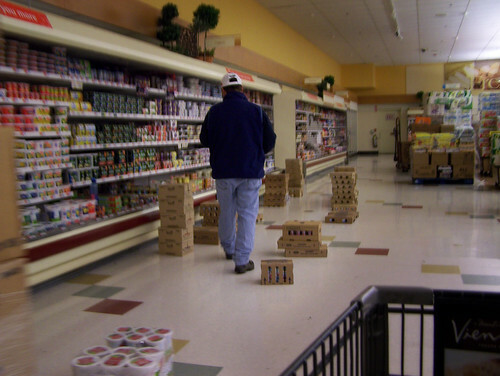 When you go late night you usually have to bob and weave around all the boxes of product and the guys stocking it, including this guy who was restocking the yogurt. Gotta love the Yogurt Man! Not as much as the Ice Cream Dude, though. Or the Chip Guy. Stocking shelves would be ok. Wouldn’t want to stock the freezer section though. What are the boxes doing everywhere? Is the guy trying to make more work for himself? He is about as organized as my 6 month daughter. Orlunds last blog post..3 Stooges To Take Over Canada! toms last blog post..Dieting, It’s not gonna be easy ! !